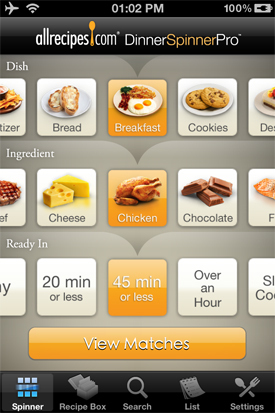 The Mealboard app is designed for planning meals and shopping. 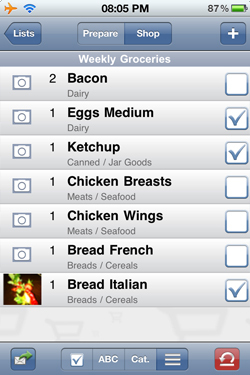 Mealboard is an iPhone app that combines both meal planning features with grocery shopping features. You can plan out exactly what you want to eat several days in advance, figure out the nutritional values of your meals and shop accordingly. 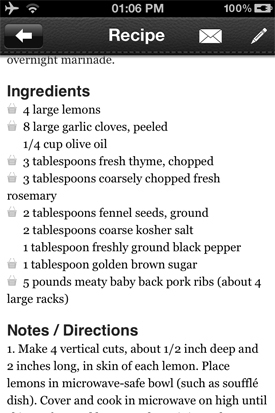 Mealboard also features a recipe database. Built in are about three dozen recipes, featuring meals from breakfast till dinner. 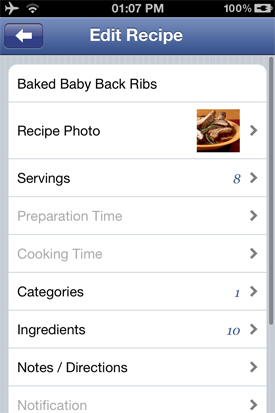 The app makes it easy to add your own recipes. Once you’ve added a recipe, all you need to do is add that meal to your planner and all the ingredients for that meal will be conveniently added to your grocery shopping list. 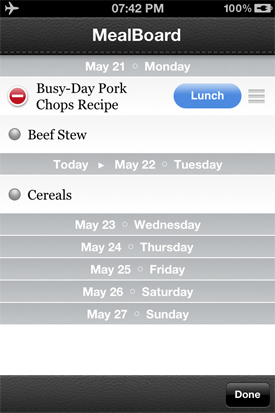 Here’s how to use Mealboard to plan your meals and grocery list. 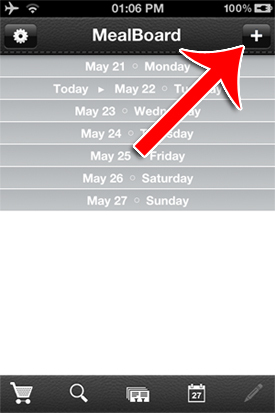 Upon starting up the app, you’ll be presented with your calendar with all your future meals planned out. If it’s your first time, your calendar will be empty. 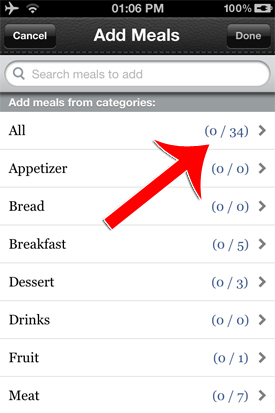 To add your first meal, click the plus button in the upper right corner. Choose which category of meals you’re eating. 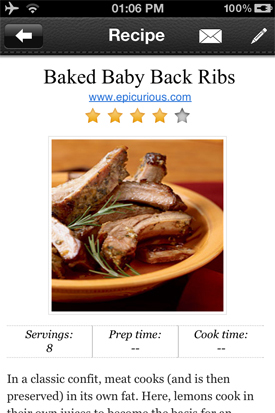 You can click “All” to see all the recipes you have in all categories. Then select the specific meal you’re interested in scheduling. Once you select a recipe, you’ll be presented with details about that dish. The ingredients will be listed below the description. 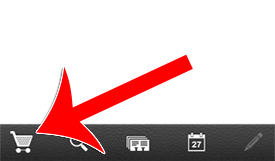 If you want to edit the recipe, click the pencil button in the upper right corner. The edit box will appear with all the recipe’s details. Edit as you see fit. If you want to share your recipe with a friend, click the email button in the upper right corner. 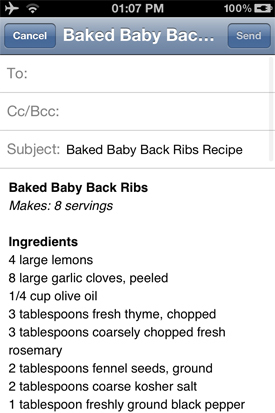 The email client will be pre-populated with the recipe you want to send. Just enter a recipient and a subject to send them your recipe. If you don’t see a recipe that you like, you can create a new one from scratch. 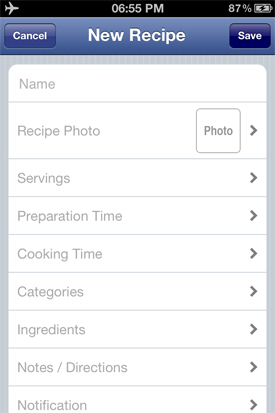 It might seem like a lot of work to have to input your recipe(s) into an iPhone app. While it does take effort the first time around, the effort pays off. 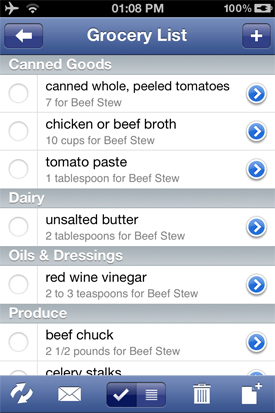 Once you have the recipe in your app, you’ll be able to at any time create a shopping list with all the things you need to buy to cook that food with the click of the button. It’ll save you a lot of time in the long run. To create a new recipe, click “Create New Recipe” at the bottom right of the recipe selection screen. You’ll be presented with a blank recipe form. Fill it out to create your recipe. Once you’ve selected a meal, you’ll be taken back to the home screen. There you can drag and drop the meal into the day of the week that you want to have that meal. 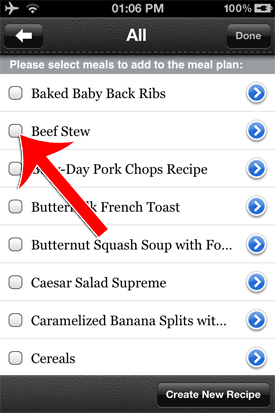 You can also click the blue button to choose which meal (breakfast, lunch, dinner) that recipe is for. To generate your shopping list based on your upcoming week’s meals, click the shopping cart button in the lower left corner. 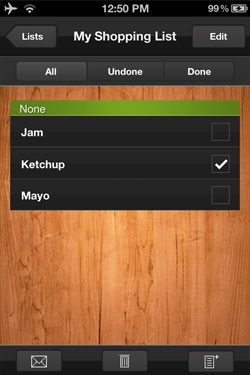 Mealboard will now automatically generate the shopping list for you. Your shopping is conveniently broken down by categories, so you can easily find everything you need to in a certain aisle. That’s how you can use Mealboard to plan out your meals and make grocery shopping a whole lot easier. Getting used to the app may take a week or two, but once you’ve gotten used to it, it can be a huge time saver.